Saturday March 10th 1923 Did some sewing in forenoon. Wrote Ott & Rob. Went down town in PM. Was at The Library while Mrs Falk went to picture show. A warm day. Sunday March 11th 1923 Went to SS and church. Had dinner and came on home. I wrote Hattie & Laura. Read some. A very warm day. We had music in the evening. Monday March 12th 1923 Did some work up stairs and sewed some in AM. We started down town after dinner. Had trouble with the car and rode with Mr. Nutting. Went to picture show. Letter from Nellie. Late home. Very warm day. 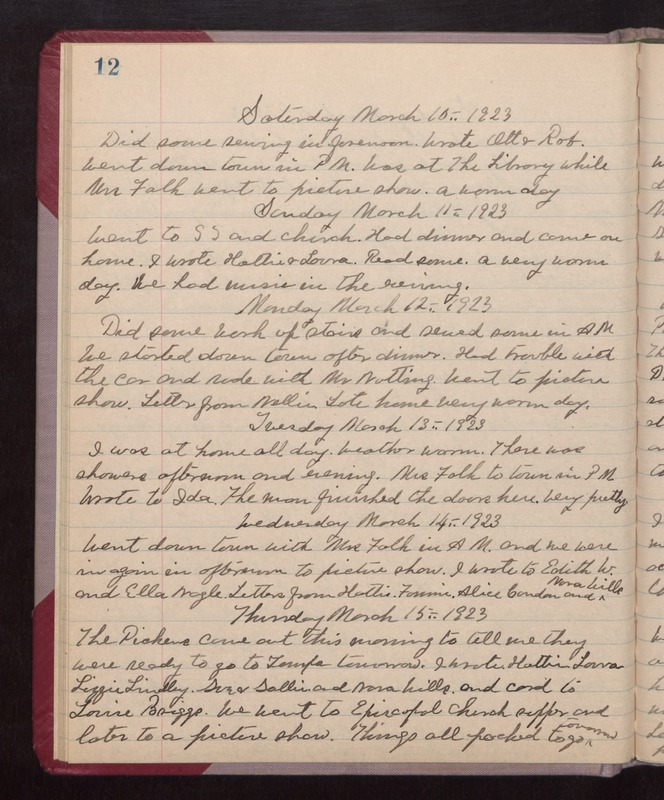 Tuesday March 14th 1923 I was at home all day. weather warm. There was showers afternoon and evening. Mrs Falk to town in PM. Wrote to Ida. The man finished the doors here. Very pretty. Wednesday March 14th 1923 Went down town with Mrs Falk in AM and we were in again in afternoon to picture show. I wrote to Edith W. and Ella Nagle. Letters from Hattie, Fannie, Alice Condon, and Nora Wills. Thursday March 15th 1923 The Pickens came out this morning to tell me they were ready to go to Tampa tomorrow. I wrote Hattie, Laura, Lizzie Lindley, Sue & Sallie, and Nora Wills, and card to Louise Briggs. We went to Episcopal Church supper and later to a picture show. Things all packed to go tomorrow.